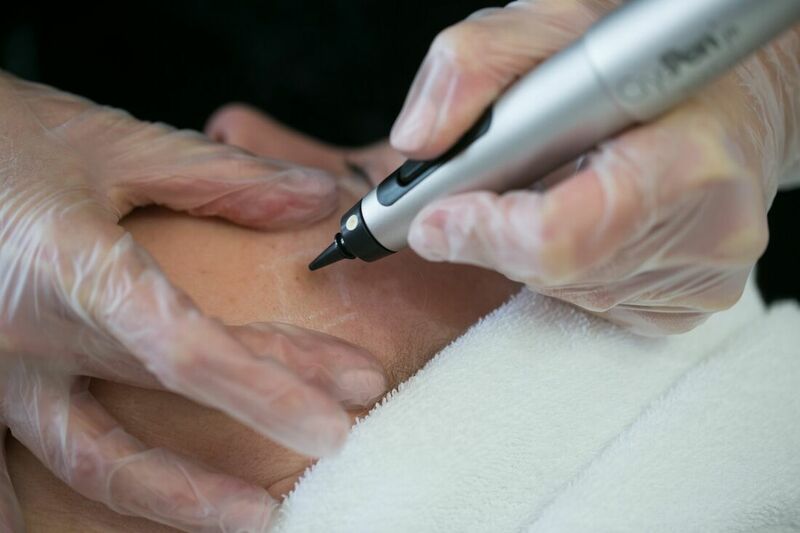 The CryoPen is directly and precisely applied to the skin lesion, liquefied nitrous oxide is then released leading to a deep and rapid freeze of the treatment area. Little to no preoperative skin preparation is required and follow-up care is not necessary. 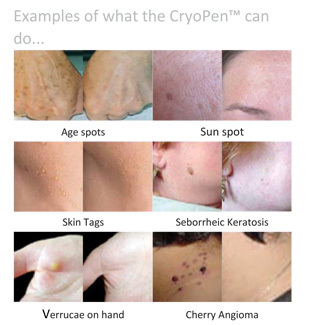 Cryopen offers the ideal treatment for : Skin tags, Solar Lentigo, Age Spots, Millia, Warts, Cherry angioma, Viral Verrucae On the hands, face and décolletage. Sebaceous cysts, undiagnosed lumps and bumps. With GP letter we might be able to treat seborrheic keratosis( old mans wart) otherwise we could not treat. Also people with diabetes we would need GP letter for any type of treatments with Cryopen. The penetration into the tissue is at approximately 1mm per 5 seconds; therefore it will only take 10 seconds to treat a 2mm lesion, with no anaesthetic required. As the procedure is performed you may feel minor discomfort as the freezing takes place, however most people state this is not unpleasant more like a prickling sensation. The treatment provides a long, deep freeze resulting in a more effective treatment, with fewer repeat visits. Within approximately 3 to 4 days you will notice a change in the treated area, between the seventh and tenth day the skin lesion should shed. Healing will then begin, after 3 weeks optimum results will be seen.